An aquarist is responsible for the care of fish and marine mammals kept in captivity. Aquarists have a wide variety of duties primarily focused on providing care for marine creatures and maintaining a quality environment for these animals to live in. Primary duties for an aquarist include monitoring water quality and temperature, cleaning tanks, repairing equipment, designing exhibits, giving educational presentations to visitors, observing animal behavior, providing behavioral enrichment activities, and preparing and distributing food each day. Some positions may also involve restraining animals for veterinary treatments, capturing, and quarantining sick animals, or breeding replacement stock for the aquarium. In some cases, an aquarist may be required to travel to various locations (often both domestic and international destinations) to collect specimens from oceans, rivers, or lakes. These captured specimens must then be safely contained and transported back to the aquarium. Open water diving skills and certifications are necessary for this sort of work. A passport is also required for international travel. Aquarist careers often require strenuous physical activity, significant periods of time spent in the water while outfitted in scuba gear, and the use of tools and equipment to complete the required tank maintenance tasks. A variety of organizations may provide employment for aquarists including aquariums, zoos, theme parks, laboratories, and research facilities. Positions exist primarily with private businesses but may also be available with divisions of government. Experienced aquarists can advance to supervisory and managerial roles such as curator positions within the aquarium. It is also possible to branch out into other related positions such as marine mammal trainer, veterinary technician, or marine biologist. Aquarists must have (at minimum) a Bachelor of Science degree in marine biology, zoology, aquaculture, or a closely related area. Scuba diving certification is also required, as is a certification course in first aid and CPR, to ensure that the aquarist can safely carry out their duties (which may involve a significant amount of time spent underwater). It is wise for aspiring aquarists to pursue marine internships to gain valuable hands-on experience in the field. There are many paid and unpaid opportunities to work with marine mammals, turtles, fish, and other marine life. 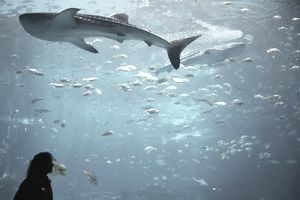 Volunteer work at local aquariums and zoos will also lend strength to the career seeker’s resume. Many aquarists choose to become members of professional groups related to marine animals. These groups provide a variety of networking opportunities, educational information, and other support to the aquarist community. One of the most prominent groups for aquarists is the Association of Zoos & Aquariums (AZA). The AZA is an organization that also provides accreditation to zoological parks and aquariums that meet criteria related to conservation, science, and education. Individual memberships in the AZA are available to employees of zoos, aquariums, related facilities, or organizations designated as conservation partners. There are also many international, regional, and state groups that can provide information and support to aspiring aquarists at the professional and hobbyist levels. The Bureau of Labor Statistics (BLS) does not separate aquarist salary data into its own separate category in their salary survey, but they do include the career as a part of the more general category of nonfarm animal caretakers. In 2017, the BLS reported a median salary of $22,950 per year for nonfarm animal caretakers. Experienced aquarists in supervisory roles earn significantly higher salaries, often in the range of $40,000 to $50,000 per year. New aquarists should expect a starting salary more in the range of $18,000 to $20,000. Of course, total compensation may also vary due to the geographic area, the size of the aquarium, the aquarist’s area of specialization, and the specific duties the job entails. The Bureau of Labor Statistics (BLS) survey indicated that careers for nonfarm animal caretakers would show a 22 percent increase over the decade from 2016 to 2026, a rate much faster than the average for all careers, and this should also be reflected in the growth rate for aquarist positions. There is also a particularly high turnover rate for aquarist positions, as they are frequently used as an entry-level stepping stone to other marine careers. Positions working with marine mammals tend to be the most difficult to obtain, as there is a particularly strong level of interest from individuals wishing to work with marine mammal species, such as dolphins, seals, and whales. Those interested in marine mammal aquarist positions should gain significant experience through internships to strengthen their resume, as there are usually many applicants for each available position.